A star in the wings. Coach K speaks to Team USA potentials in this video. Kevin Durant, Devin Harris, Andre Iguodala? They want to play for K and Country. Dave Rothenberg talks with Seth Curry on 850-The Buzz. He should be a phenomenal asset in the next few years. Expect the best and the brightest from the classes of 2010 and 2011 to be in Durham on August 22-23! An interesting take on Coach K’s Olympic post has affected Duke’s recent recruiting history. 2010 target Kyrie Irving, of Elizabeth, NJ, drops 37 points in a win against heavily-favored Team Final in the Nike Super Showcase in Orlando, FL. 6. Team USA wins gold…again. The Men’s U-16 team, led by 2011 target Brad Beal, of St. Louis, MO, won the gold medal at the 2009 FIBA Americas U-16 Championship. The New York Times runs a feature highlighting the experiences of American college students. A Duke engineering student and a UNC freshman submitted articles. 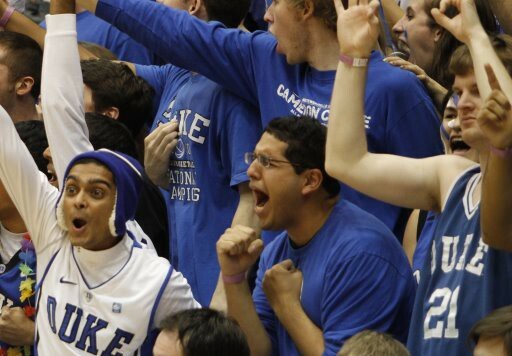 This is just another example of why we are proud to be Duke students and represent our University. Mr. Singh writes a compelling article about the cultural differences between his native India and college life in the United States. On the other hand, Ms. Banks does little more than insult Duke, although UNC has much to offer its students. This is yet another example of how the Duke-UNC rivalry goes beyond basketball—with mixed results. I LOVE the Deviled Eggs. So concise and to the point!